Our high quality 2-1/4" x 3-3/4" business card laminating pouches with short side slot help to improve the value of all printed materials. They enhance colors by turning dull prints into bright lustrous colors, help to prolong the life of printed materials and preserves them and protect them from outside elements. I'm glad you had this item. It isn't easy to find these specifications. Thank you. The shipping was prompt, and it came in much sooner then expected! Thanks!! Exactly what I ordered. Work perfectly for our name badges using business cards. Welcome to MyBinding video. Whether you're preserving or presenting a business card, we have a laminating pouch just for you. They come in a thickness of 5 mil, 7 mil, and 10 mil. Each pack comes with a stack of pouches and a carrier. 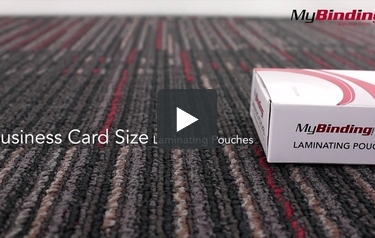 To start off, place your card into the pouch and align for correct and even margins. Then place your pouch into the carrier. The carrier will ensure that no extra adhesive from the pouch gets into your machine. Next, insert your carrier into the laminator and soon enough, you'll have a finished product. Also be careful in removing the pouch because it probably needs time to cool down first. And that is business card size laminating pouches. For more demos, reviews, and how-to's, check out MyBinding.com.